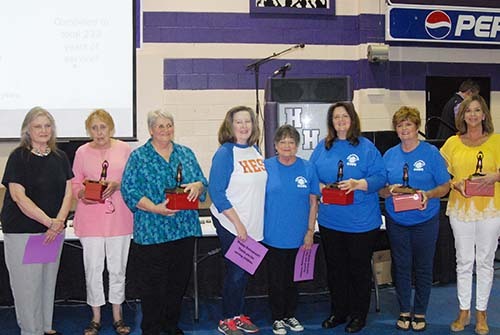 2018 Retirees: Janice Bird, Anderson 28 years; Sylvia Harwell, Anderson 35 years; Linda Whitten, Anderson 9 years; Vivian Miller, Haywood Elementary School 25 years; Haywood Middle School, Mary Lefave 34 years; Haywood Middle School, Sally Brown 34 years; Haywood Middle School, Jane Jameson 14 years; Haywood Middle School Linda Rhodes 12 years; Haywood High School, Glynn Bridgewater 42 years. 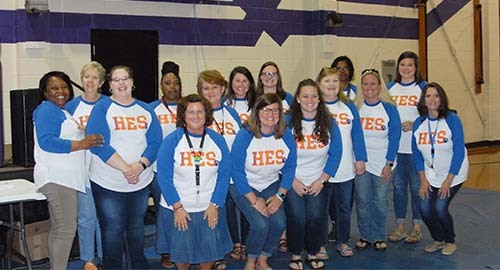 Friday, May 10, beginning at lunch, was a celebration of Haywood County employees. 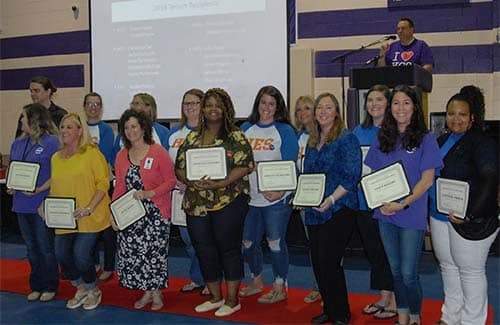 Superintendent Hassell and his staff members were the hosts and recognized the employees for time of service, perfect attendance and for those who are retiring. 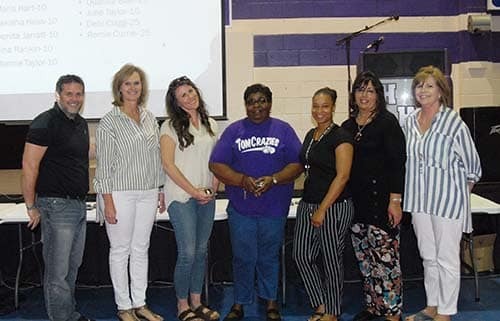 At Anderson: Cuwannia Kent earned a 5-year pin; Charles Byrum, Amanda Masters, Leslie Phillips, and Jessie Warren earned 10-year pins; Ginger Cunningham and Caroline Wiley earned 20-year pins; Denise Hooser, Joan Wallis, and Cheri Williams received 25 year pins; and Sylvia Harwell received a 35-year pin. 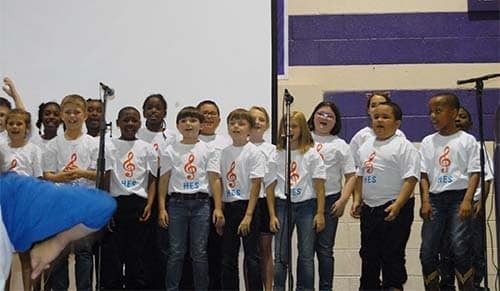 At Haywood Elementary, Marrgie Howell, Brenda Jackson. 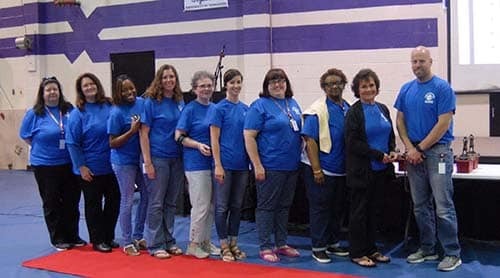 Holly Northcott and Megan Simpson received 5-year pins; Beverly Austin, Elizabeth Lovelacce, Wychickia Watkins, Rachel Winberry and Pat Worrell received 10 year pins; Mary Beth Freels received a 15-year pin; Joyce Sanderlin and Amanda Stanley received 20-year pins; Patricia Gaietto received a 25-year pin; and Lee Ann Garrett received a 35-year pin. 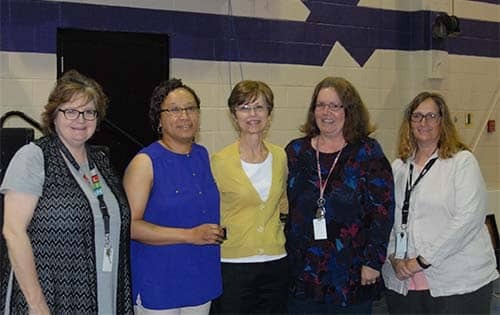 East Side, Cecilia Frost received a 5-year pin, Monica Johnson received a 10-year pin, Deborah Kelso received a 20-year pin, and Dorothy Jackson received a 25-year pin. 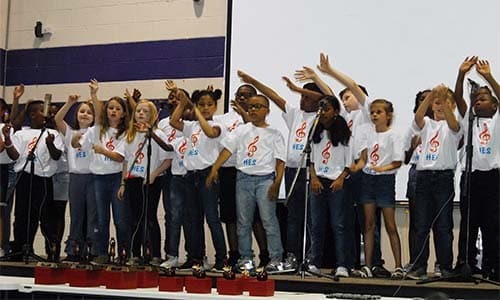 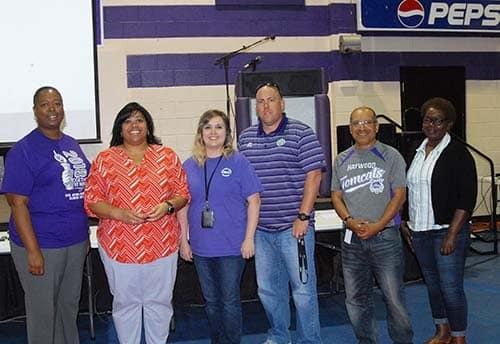 At Haywood Middle School – Michelle Howell, Sam Pyron, Jason Winfrey and Desiree Russell received 5-year pins; Grover Harwell received a 10-year pin; and Claudette Shaw received a 20-year pin. 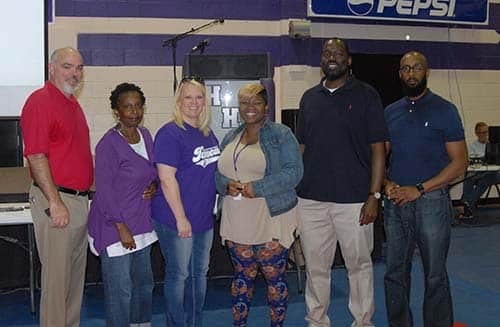 At Haywood High School, Chris Eubanks, Tyler Newman and Shandi Sheets received 5-year pins; Humberto Aguilar and Dumanic Wade received 15-year pin; and Beverly Greer received a 20-year pin. 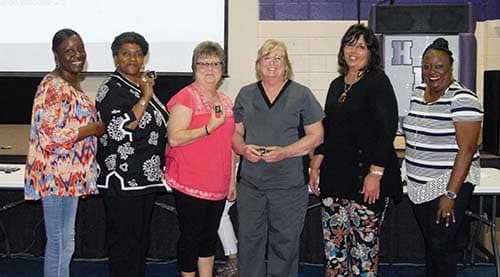 In the Food Service, Leare Bond, Carolyn Cooper, Glenda Hess, and Lucy Trotter received 20-year pins; Joyce Sharp and Sharon Waddell received 25-year pins. 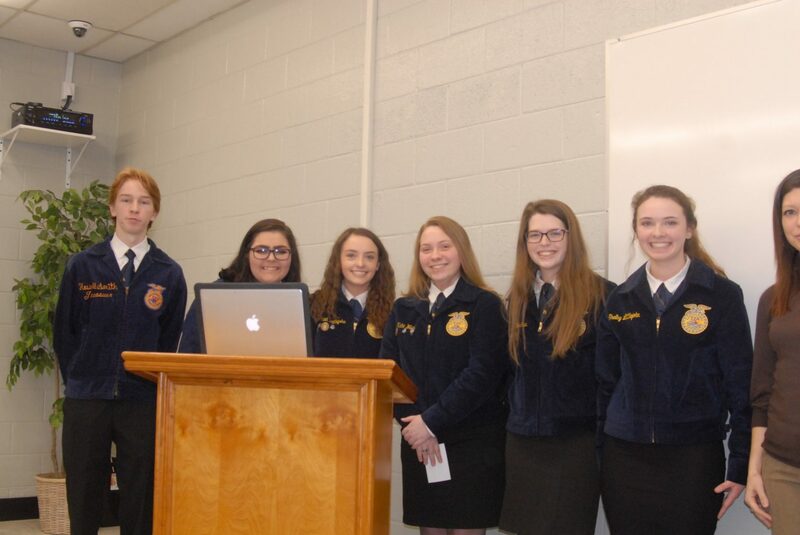 At the Board of Education and in the Transportation Department. 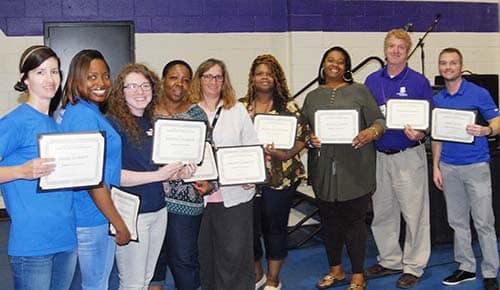 Jessica Reggans received a 5-year pin; Maria Hart, Lakisha Hess, Denita Jarratt, Tina Rankin, Ronnie Taylor, and Finis Wilson received 10-year pins; Quanita Clair and Julie Taylor received 15-year pins; and Romie Currie received a 25-year pin. 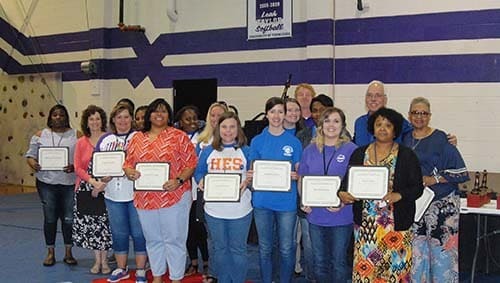 Recognized for Perfect Attendance were Jessie Warren, Cuwannia Kent Rebecca Pearson, Darlene Wellington. 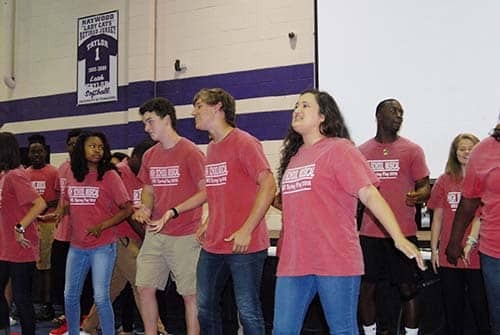 Tressy Halbrok, Shaquana Leonard Sheena Parker, Timothy Martin Chris Davis, Jerred Mize, Ben Rodgers, Johnnie Rodgers, and Billy Watkins. 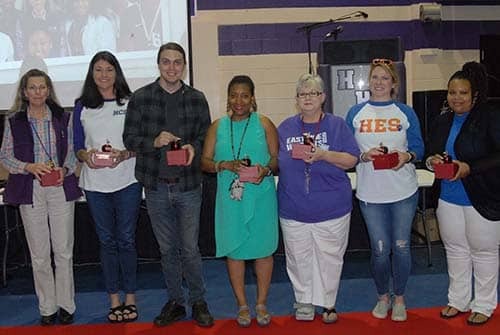 2017-2018 Teachers of the Year are: Anderson – Crystal Foster, Haywood Elementary – Lacey Gaylord, East Side Leigh – Anne Allen, Haywood Middle School – Charita Perry, Haywood High School – Holly Chilcutt, HHS Career and Tech – Brandlin Turner, Sunny Hill Innovative Learning Center – Julian Stanz, Linda Baxter – Chamber of Commerce Educator of the Year.